Hi Vanessa, thanks for dropping by. I thoroughly enjoyed The Coward’s Tale, the vibe is different to most novels I read. It’s poetic, thoughtful, melodic, it felt like I was reading a “classic” novel. There’s a sense you’ve built something to last. Was it always your intention it would feel like an older novel or did it grow to be that way? That’s the best bit of feedback a writer could get. Coming from a Waterstones bookseller, even better. YAY! That’s almost enough to make me get out of bed. (No nothing exciting, sorry. Flu…) I didn’t expressly guide it to feel like a classic – or older novel (if they are the same…) but I guess I wrote the sort of thing I could stand to inhabit for five/six years. Maybe that added up to classic/older? The language, of course, puts me in mind of Dylan Thomas’s Under Milk Wood. You mention a character borrowing his book from the library, and I presume The Cat pub is a nod to Captain Cat? Any other references? Good. I am glad. The language in ‘Under Milk Wood’ is wonderful. So is the language in a book by another iconic Welsh poet, David Jones – ‘In Parenthesis’. Of the two books, the latter is vastly, but vastly superior. It is a poem, a play for voices, a novella…it certainly influenced Thomas, and they both influenced me, but in different ways. I believe DT even took a part when ‘In Parenthesis’ was recorded for the radio – but then someone can tell me I’ve got my facts wrong, and I won’t be upset. Timescales certainly mean Thomas knew ‘In Parenthesis’ well. Jones fought in WWI, and it tells the story of one battallion up to and including The Somme. It is raw, dark, beautiful, true, ironic, can be funny in places untiul the main events loom – But when Thomas went to write his own poetic play for voices, he wanted (again, I believe…) to react against the horrors of war, in his case, WWII. Under Milk Wood was deliberately light, pretty, quirky, but some might say it is a bit unkind… and it portrays a vision of Wales that never existed. He did well out of it, though – so much so that give anyone a bit of Wales, and a bit of lyricism, it has to be thanks to UMW. I wanted to write this novel, set loosely in Merthyr Tydfil, a town in the s Wales valleys, because I loved going there as a child, and my parents’ love for the place never diminished. I wanted to go further than portraying a Wales that never existed. The Wales I was brought up with is the Wales that did exist, in which one great grandfather went to work down a coal mine aged eleven. His job was to hold the ventilation doors open or shut, often knee-deep in water. Family history says that when his candle went out (as it did, soon enough every day, in the draft) he was in the pitch black, except when a collier stopped for a word. Its a Wales where the town that gave my parents life became the subject of a House of Commons Debate – because of its appalling health record (cholera, typhoid, malnutrition,) they at one point considered raising it to the ground and shifting the population to the coast. The town that had at one point been slap bang at the centre of the coal and iron industry. The Wales I was brought up with is the Wales where the Depression hit like a great fist in an empty stomach, where my adoptive mother and father were unable to stay if they wanted good jobs. And where we went back to, as often as we could, to be with the grandparents, uncles, aunts cousins – because it was ‘going home’. Contemporary writing centred on towns like Merthyr so often portrays the issues stemming from some of the highest levels of unemployment in the UK. Drugs, crime, grit. I didn’t want to, and couldn’t, add to that canon. Anyway, I’m drifting. Did you pick up an emotional thread there? Ha! From DT I learned to create a community out of actions and voices. From David Jones I learned how to be true to something – to create not just a troubled community, but the darkest of days in its past, not flinch from looking it in the eye, while trying to make the darkest of days still darkly beautiful. And from my mother, a librarian, and my father, who was decorated in WWII, I learned the rhythms of speech of the valleys. That never left them – my dear Dad was still recogniseably a boy from the valleys at 95. All I had to do was recall the language of my grandmothers, her neighbours, and the direct speech was there. The banter. On occasion, it got overdone, mind you – and a lot of work went into smoothing it out! Wonderful answer. I must confess to not knowing David Jones – I’ll have to check him out. I love the names and the nicknames. How did you think of them? Helped by the characters themeselves, as ever – a character doesnt ‘feel right’ to me, and I can’t write them out, until they have given me their right name. Anyone else like that out there? If you lived in the village with your characters what would your nickname be? You have to spend a week with just one of your characters. Which one and why? Oooh, what fun. Hmm. Peter Edwards. I want him to teach me to listen to the stories in stones. The novel is full of stunning, evocative writing. Was it hard to maintain the voice? In a way, that’s for others to say. Those lines are from the very first section I wrote, now called The Clerk’s Tale – and I didn’t think about what I was doing – the voice was just that of one story. But of course, after that story did OK at a few places, and as I was encouraged to write it as a novel, I did become aware of what I was doing, and that is fatal. With the next piece, I went right over the top, and the voice became more like a concrete mixer full of reversals – and I had to do a hatchet job, and get back to more normal-sounding rhythms. I kept in the odd nod to my family phrases. ‘Nowjust’ was one of my grandmother’s words.. I used to smoke ten before going to sleep. Did you read aloud? Did you reject non-poetic sentences? Yes. Always. I spent the second week of a two-week stint at Anam Cara reading every sentence of the first completed draft out loud, editing for rhythm and sound. I wanted the whole thing to have the feel of a poem, or something. I noticed that food features quite often so I have devised a foodie section for the interview. Mashed banana and brown sugar, with a cuppa. What, with banana, are you nuts? What are your feelings on sandwich paste and sandwich spread? Paste, NO NO. Sandwich Spread YES – but as it was. They’ve changed the taste. This is another nod to family memory – I used to live on sandwich spread sarnies at my Nannas, and spent ages picking out the little ball things – I think they were mustard seeds. I fed them to the budgie. Beetroot – yay or nay? Yay! And with cold lamb too. Wonderful combination. Ianto Passchenaele Jenkins takes payment of toffee (and other confectionary) for his stories. What would your sweet payment of choice be? The same as his. Toffee, or Spanish. (Liquorice). Page 251 (of the hardback) has a beautifully telling description of Tommo Price’s tea. It says so much about his wife, Sarah. I think you have a very deft way of revealing character. What teas would you write for David Cameron and Barack Obama? Brown boiled eggs and granary soldiers. And at some point, Cameron might say ‘oops, its an egg, you know, not brown because of anything, um, snort, (Eton snigger…) would you prefer white?’ But he’d give it a good bang on the head with a spoon anyway. They’d have a plate of jolly good British cakes, Eccles, Dundee (well, British for the moment) Chelsea buns (he’d dip those in his egg). He’d also have Welsh cakes but Samantha would say what’s those darling, and he’d hum and ha and slip them to the dog. He’d have a packet of Yorkshire teabags in camera-shot on the side, Cornish butter (hand- churned by the Duchess of Cornwall). And when the cameras and the Obamas had gone, they’d clean their teeth and start again with caviar on blinis and call up Osborne to call by and bring the bubbly old chap, let’s sell the roads to the Chinese by six, and don’t tell Cleggers. I’m struck by some of your vivid descriptions. “… go back up to the Reading Room, where one of the strip lights will be flickering and buzzing like a caught wasp.” I was delighted by how exact that description is. Is it something you’d noticed before and tucked away to use in fiction or did it come to you as you were writing? Not specifically tucked away. I suppose when you are really inhabiting the world you are creating, you experience things in a very ‘real way’ – so they come bounding at you with great clarity. We’ve all heard and seen those strip lights! Are you a notebook carrier, always scribbling details down for future? Or? Yes. Although usually, when a thought of great genius arrives, I’ve left the thing at home, and can’t find a pen. So I go into the nearest Smiths, and buy another – by which time I’ve forgotten the idea in the first place. Story of my life. But yes – I’ve usually got a pen/pencil notebook somewhere. Do you see another novel for the world you’ve created? I am glad of that feedback, S, really. The next novel will tell me what happens next. And quite possibly, what happened before, as well. Ianto and Laddy are the main characters. Fathom that one out. I’m delighted to hear that I’ll be able to read more about Ianto! Excellent news. Bloomsbury have given me a copy of the paperback to give away. I thought it might be fun to get people to describe the tea they’d imagine a famous person to eat in the comments and you could pick your favourite as the winner? Brilliant idea – only the person must have some link with Wales. Dead or Alive. Howzat? Sara – thank you so much for letting me perch, and for coming up with such yummy questions. 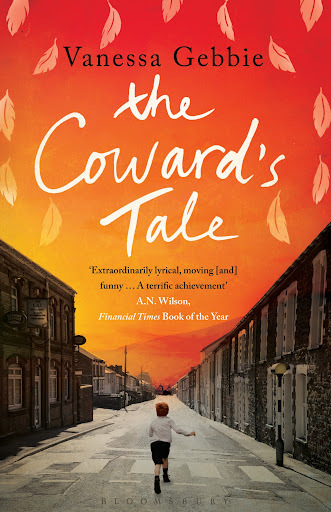 Right then, if you’d like to win a copy of The Coward’s Tale please do describe a tea that a famous Welsh person (dead or alive) might eat and post it in comments and Vanessa will choose the winner in a weeks time. The Coward’s Tale tour continues at Claire King’s blog and Tania Hershman’s where you’ll be able to enjoy a far superior style of interview! What a yummy interview! Just fabulous, thanks both! Very enjoyable, both of you, I have the book so don't need to enter. Terrific interview – made me hungry for a Nursery Tea! Great interview and such fun. Thank you! Off to bake my cake. Lived in South Wales for a couple of years – lovely to bring out the accent in my head! The music of it.Really jolly rolling interview, ladies.